Any chance of seeing these calculations? Sorry, you'll have to find a local 10 year old if you want to see the calculations. So you have realised that your theory is busted because no such acceleration has been observed for the ISS or any orbit? Yay! He actually killed his own theory!!! Last edited by Bjarne; 11th January 2019 at 02:27 PM. This correspond to (reveals) that the solar system is moving 950 km/s (south) – this is 350 km/s more as Dark Flow is measured to be. Maybe our universe as a hole is on the move too etc…. To exposure of the full range of RRKE connected to Dark Flow, - Oumuamua (or other objects) must be (more or less) under the Sun (south). Acceleration due to gravity is 8,7 m/s2 at that altitude. Last edited by Bjarne; 11th January 2019 at 02:36 PM. What exactly is this supposed to mean? You previously included “under the earth” with “south“. Under the Earth with respect to what, exactly? “South” of what, exactly? Bjarne, get off it. You're just rambling. It a cow drives a tractor to an elevator to the ISS does it make sound? Bloody good question that! Don't know the answer. RR is a reversible process. This means that if no force pushes / pulls an object (further) towards the RR direction (see principle 4), the object will decelerate. The RR affecting an object can be compared to a retracted arrow. All that is required for the retracted, potential, kinetic energy of the arrow to be released is that the force of the string is released (which also illustrates that motion opposite DFD will cause less RR, also simple to calculate based on the Lorentz equation). Release of Retracted Potential Kinetic Energy (in short RRPKE) will affect any object moving more or less away from DFD (or any other RR affected direction) , depending on the angle of movement away from DFD. Lets therefore assume that this acceleration ALL original from Dark Flow related RRPKE . Which mean 18000 stronger as necessary to cancel out DFA. Which mean the DFA (that was effecting Oumuamua) was canceled out completely many weeks before and after Oumuamua 's perihelion. Therefore we have reason to conclude, - that the full potential of the Dark Flow related RRPKE (that was effecting Oumuamua ) began to release it self, - right after Oumuamua went "under" the sun..
A model that compare none gravitational acceleration, - 1.) observation and 2.) calculation must off course be made before we can get this more exact. The theory of (especially) special relativity must be modified. Last edited by Bjarne; 12th January 2019 at 03:09 AM. To my big surprise I need a force almost 100 times stronger as the MTR predict. I checked the data agian and again but the forces was indeed much too weak. Then suddenly tonight the solution striked me. I discovered a new aspect of the theory, - not quite new, but rather overlooked aspect of an old principle. So long Oumuamua is under the Sun, the upwards acceleration of the Sun will simply counteract a large part of the Dark Flow Acceleration affecting Oumuamua , this is allowing a huge part (maybe) all of the Retracted Potential Kinetic Energy connected to the Dark Flow to be Released, - or rather to start a releasing process. The result is a SIGNIFICANT acceleration. It opens the doors to how the MTR in a cheap way can be further confirmed. (satellites experiment VERY close to Earth). Such will blow a GIGANTIC hole in the prevailing theory of relativity, that never never never agian will be the same. Oh great, you are admitting that everything you posted up to now was wrong and are replacing it with a new thing you extracted from your hinterland. Bjarne, now you need to prepare a paper with all related math and proper references. Then submit it for peer review. Let them declare your great achievement or explain why it cannot be. The ISS will increase speed at least 40% of the orbit time and hence reach a speed increment per orbit close to 0,01 m/s - This is easy to measure. I wonder why this not have been discovered so fare. 1. You didn’t answer the questions. 2. That’s not what “reversible” means. It is because it doesn't happen. If your theory predicts an “easy to measure” result that you have not observed, what might we conclude about your theory? Last edited by Mojo; 13th January 2019 at 04:24 AM. If you really knew what relativity was about then tell us all what is the cause-effect of time dilation. Its is not enough to say:, - because of relative motion bla bla bla bla bla bla bla bla. Tell me as i wrote, the cause-effect of that strange phenomena. We have been over this before but you simply continue to ignore it. If you are going to ascribe "time dilation" as the "effect" then the "cause", in SR, is relative motion and the local consistency of the speed of light. Fundamentally it is just the result of choosing different frames of reference with the local consistency of the speed of light. Again a physical space is "made of" physical locations, whether that space is curved or flat. The difference between those topologies, flat or curved, is how those locations relate to each other (the metic, or manifold of, the space). Again, what is your space "made of" if not at least locations? Tell me also what is the cause effect of the curvature of space. Again in general relativity the cause of the curvature of space-time is the stress energy tensor. I need the cause -effect for these 3 phenomena’s..
"time dilation" and "the curvature of space" are only 2 "phenomena’s" and as noted in the links the invariance of the space-time as well as the energy-momentum four vectors is associated with the invariance of the speed of light and the rest mass of the particle respectively. You cannot, because this theory is full of huge holes of emptiness. Many have accepted the theory, - but don’t tell me anyone have understood what this theory really is about. As you have been advised of all this before it is evidently only you who hasn't "understood what this theory really is about." Even after having been advised of such, multiple times. You previously included “under the earth” with “south“. Under the Earth with respect to what, exactly? “South” of what, exactly? . After using a couple of hour today I found the RRPKE aspect of the theory was just a little more complicated as I thought yesterday, but easy to grasp, and easy to solve. And finally some crafts, - is some of the path, - first decreasing and then increasing speed. - This is the case for ISS, and I believe will will discover that too very soon, now when test is going on onboard. Exact speed Measurement I belive is part of the research. So a new kind of anomaly will be seen. We will see first -0,005 m/s - then - 0,005 m/s, this path of the Orbit the ISS is under the earth / South, effecting the ISS..
All these 3 anomalies are caused by RRPKE effect. One of many evidences showing you don't understand the theory you are criticizing , - is that you dont know why the same force (RRPKE) is effecting spacecraft completely different. You have really no idea why thee RRPKE aspect is causing such strange oppesite results, right ? Agian, it will be a honour for me to tell you, the solution. Agian today is a GREAT day. Last edited by Bjarne; 13th January 2019 at 10:11 AM. And finally some crafts, - is some of the path, - first decreasing and then increasing speed. - This is the case for ISS, and I believe will will discover that too very soon, now when test is going on onboard. Exact speed Measurement I belive is part of the research. So a new kind of anomaly will be seen. All these 3 anomalies are caused by RRPKE effects. Ah, I see. Very handy! Your theory means whatever you like it to mean in each case. Oh, Quite! It is because you want it to do so. Things are so easy in fantasy land where you can just make stuff up as you go, right? This is the case for ISS, and I believe will will discover that too very soon, now when test is going on onboard. Exact speed Measurement I belive is part of the research. Oh, Bjarne, exact speed measurement is basic to the project. Otherwise space vehicles carrying crew and supplied to it could not find it and match velocity so they could dock. Do you even realize how exactly you need to know the speeds involved, to achieve that? No Hans, but because of sometimes spacecraft moves upwards (only) by flyby, sometime downwards (only) by flyby. No Hans NOT fantasy, - have you ever hear about Wikipedia ? Theory and Observation goes so nice hand in hand in hand as these possible can. Last edited by Bjarne; 13th January 2019 at 10:25 AM. To Bjarne's defence, "south", "north", "under", and "over" are actually valid expressions when describing an object's position relative to the ecliptic. Unfortunately, this also shows how little Bjarne understands of orbital mechanics. An object orbiting Earth will spend equal times "over" and "under" the ecliptic, because it is orbiting Earth's center. It can't be only 5%(or 40% as he seems to amend it later) in one of the hemispheres. Also, the "ecliptic" has no relevance to a galactic phenomenon as the dark flow that Bjarne is talking about. The ecliptic is an arbitrary (if observational relevant) plane, defined to be the plane of Earth's orbit around the sun. Are all important factors, that all must be known and taken into account when calculating how stong RRPKE will effect an object. Furthermore if the full effect of RRPKE must result in full possible speed increment, the spacecraft must move 100% opposite RRPKE, - if only moving lets say 45° then only 50% of RRPKE force will be converted to speed increment, the remaining 50% will cause orbit inclination change. EDFA and RR will force planet inclinations perpendicular, relative to the Dark Flow axis, - first the inner planet, then slower the out planet. This is an integrated part of the theory. Last edited by Bjarne; 13th January 2019 at 10:58 AM. 11 January 2019 Bjarne: An insane statement that no deceleration will happen at LHC, etc. according to his delusions! 10 January 2019 Bjarne: v^2/c^2 is < 1 for v < c so what is 1 - v^2/c^2? The square root? The reciprocal? 1 - that? 14 January 2019 Bjarne: An inanely lying question when special relativity has the cause-effect of time dilation (cause = speed, effect = time dilation). A lying question because it is answered in my post (special relativity). The insanity of the lie is that Bjarne has been writing his delusions about special relativity for over 10 years and so must know the basics of special relativity. 11 January 2019 Bjarne: A completely ignorant and rather deluded question about time dilation (my post was about units and acceleration). 14 January 2019 Bjarne: A delusion that he can debunk his delusions and lie that yet another delusion fixes it ! A feature of real world, working science is that tae laws of physics are generally applicable. Thus when we apply the laws of physics to various situations, we get results that match the real world. We do not do the stupidity of making up a physical law that can only be applied to a single situation such as 'Oumuamua ! The stupidity is obvious. If applying the law fixes this situation then it will probably break all of the other situations where it was not applied. For example, what happens to Bjarne's delusions about the Pioneer anomaly? 14 January 2019 Bjarne: A "RRKE was predicted" lie when all he had and still has is yet another delusion. The original post on 3rd February 2016 in this thread is a spate of deluded gibberish. One obvious delusion is the 10 year old RR insanity. Adding a ignorant "potential kinetic energy" to RR to make RRPKE just makes RRPKE insane. Bjarne's deluded RR is a magical acceleration that always acts. It is not his ignorant gibberish of a "retracted arrow" that can be released. Last edited by Reality Check; 13th January 2019 at 02:16 PM. 14 January 2019 Bjarne: Some "potential of Dark Flow RRKE" suddenly released stupidity. Potential energy is not suddenly released - it is continuously converted. A high school physics example is that a body falling toward Earth loses gravitational potential energy which is converted onto kinetic energy. Bjarne is the only person in the world with his RRPKE delusion. There is not "we" !. 14 January 2019 Bjarne: Repeats his stupid "good right to claim" lie when all he has is delusions. What would give him the right to make claims would be knowledge of physics applied to the real world to produce predictions that match observsions. Digging himself deeper into a pit of ignorance and delusions is not that. Last edited by Reality Check; 13th January 2019 at 02:31 PM. ...I wonder why this not have been discovered so fare. 14 January 2019 Bjarne: A stupid question - because his delusions do not exist and so his "speed increment per orbit" is just another fantasy. He does understand how insane a "speed increment per orbit close to 0,01 m/s" for the ISS is. This is the International Space Station launched in 1998 and with an orbital speed of 7.66 km/s. The ISS got to 100,000 orbits in 2016. That is a insanely obvious speed increment of 1 km/s. In space, no-one can hear you moo. No match for the observations means Bjarne is lying that his RRPKE delusion explains the Flyby anomaly. Usual complete ignorance about the trajectory of the flybys means Bjarne is lying that his RRPKE delusion explains the Flyby anomaly. The insanity of expecting us to use his delusions means Bjarne is lying that his RRPKE delusion explains the Flyby anomaly. "Measurement and theory correspond exactly to observations" is an insane lie when he has not theory or match to the measurements. 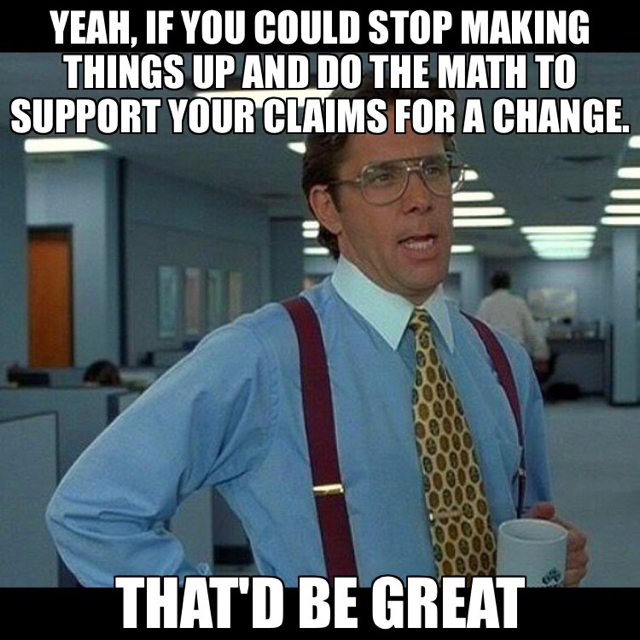 Yeah, if you could stop making things up and do the math to support your claims for a change. That’d be great.